Our family drove up to Acadia National Park/Bar Harbor, Maine with friends last month and I'm sorry I'm just now getting around to sharing the wonderful adventure with you all! 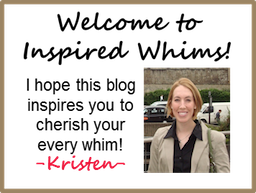 It's about time for another travel post, huh? 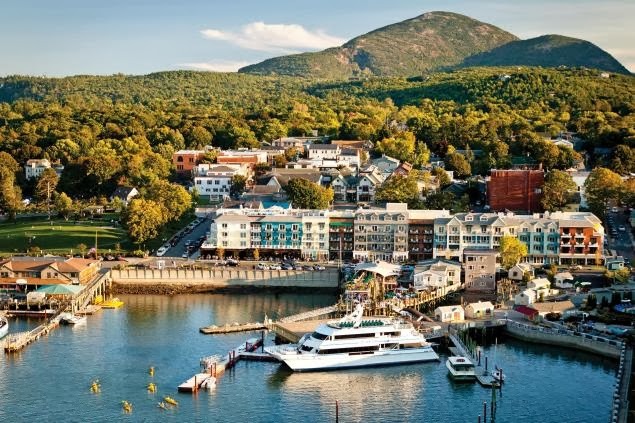 Acadia National Park (in the background) and the little town of Bar Harbor (in the foreground) sit on a quaint little island - Mount Desert Island - on the coast of Maine. 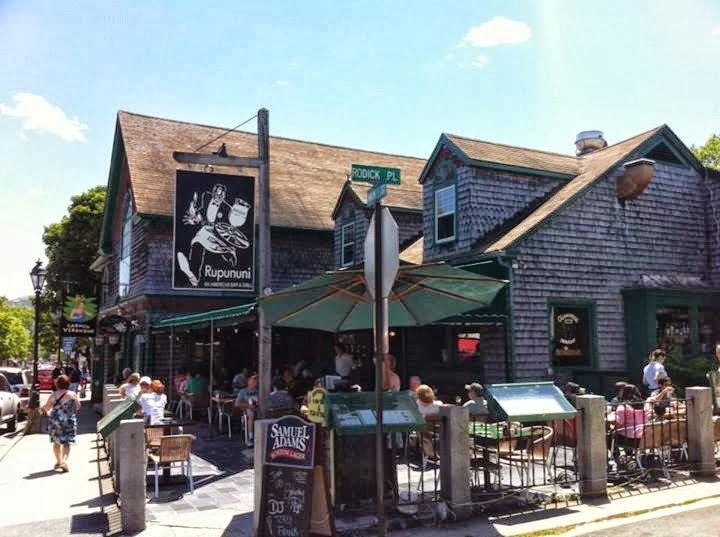 It was about a 5 hour drive from Boston to this little gem of a locale. 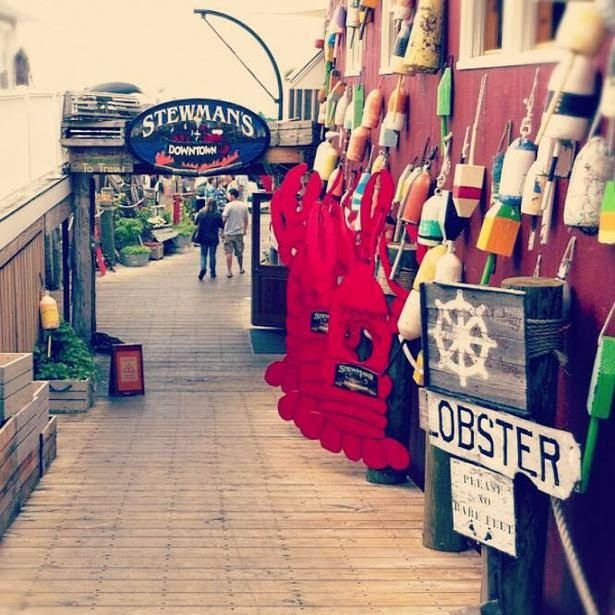 It had a little something for everyone - beautiful scenery, fresh mountain air, parks and wildlife, beaches, trails for hiking, small-town shopping, delicious lobster eating, and more. We simply adored our time there! 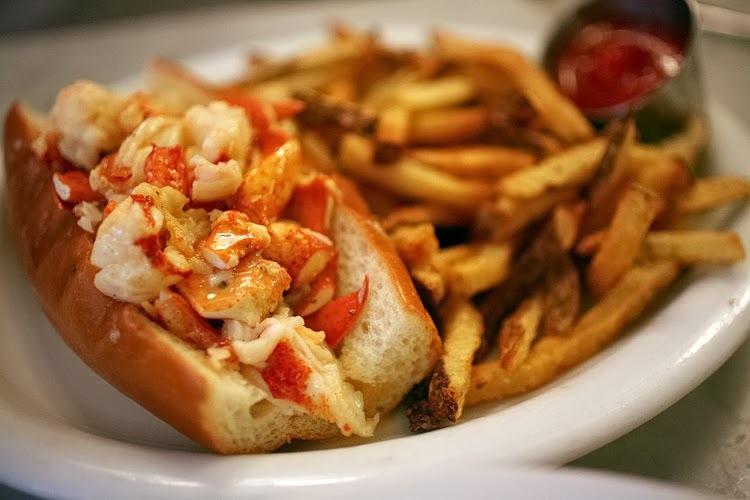 Since we stayed in a vacation rental home (via the best kept secret - vrbo.com) instead of a hotel, we opted to prepare most of our meals in house, but we did venture out for two meals at Bar Harbor restaurants totally worth mentioning. The first was Stewman's Downtown. 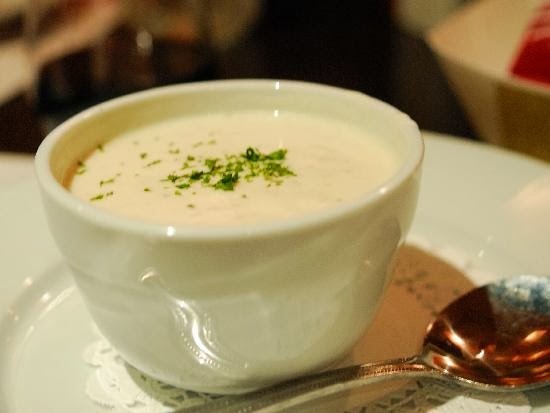 Their clam chowder was phenomenal...and that's coming from someone who typically doesn't eat seafood. Most of their seating is on a large deck that overlooks the pretty park and harbor. They had cute little lobster cut-outs for the kids (or kids at heart) to pose in. And, they had a cool lobster display tank at kid-level with all the crustaceans awaiting their unknown fate. The next must-go spot on the island is Sand Beach. It sits within the national park and offers lots of sand, crystal clear (frigid!) water, and gorgeous views. The kids loved the beach the most! It was hard to tear them away, and I can't blame them. 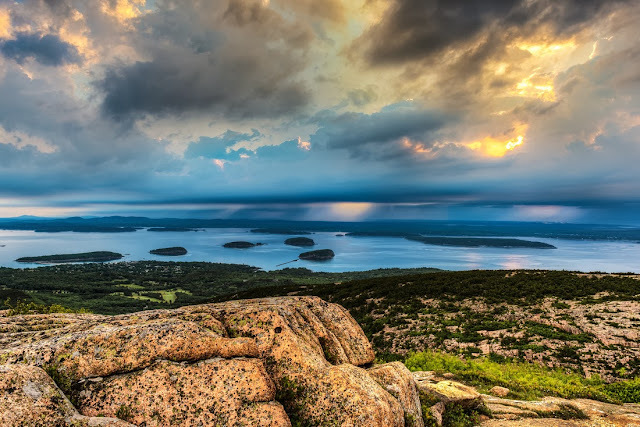 Cadillac Mountain is the highest point in Acadia National Park. We missed visiting it, but our friends made a trek up and said it was beautiful. It's the highest point for 25 miles, and has some spectacular sunrise views. The second restaurant we went to in Bar Harbor was called Rupununi's and our meal there was great! My husband ordered a hot lobster roll - just lobster and butter, as opposed to the more popular lobster roll that's served cold with mayo - and I took a bite and loved the lobster. It was very tender and almost melted in your mouth. 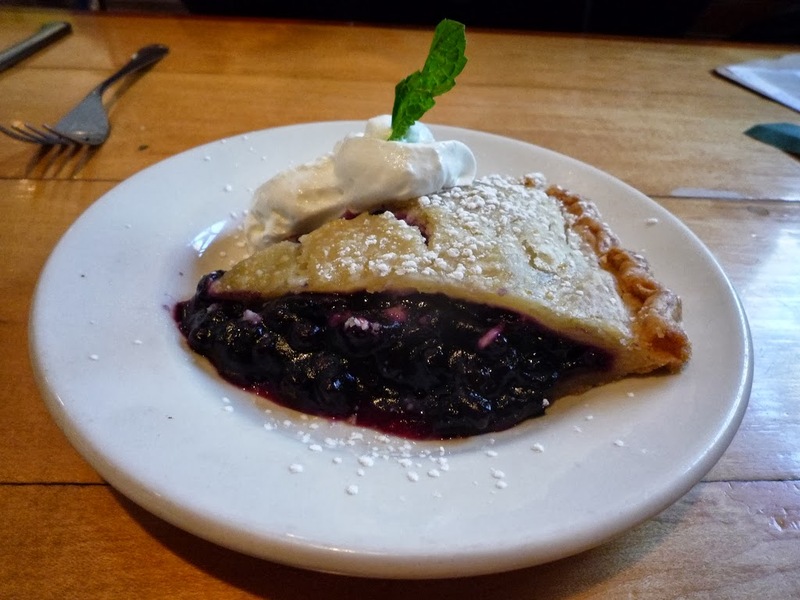 I finished up my meal with the most delicious blueberry pie. Maine is famous for it's blueberries so it was on the must-taste list. I wanted to take a whole pie home with me...it was that good. We went for a nice run along the Carriage Road trail in Acadia National Park. The system of trails run for 45+ miles - quite the recreational offering! 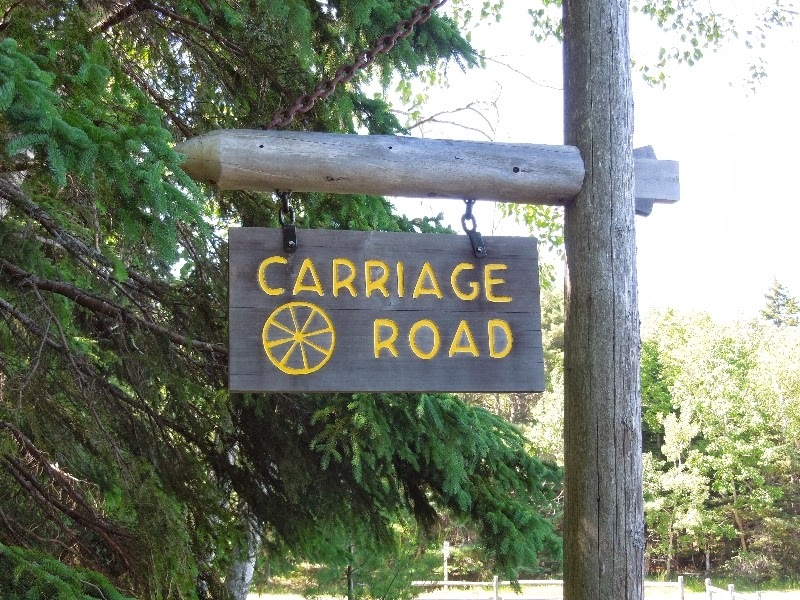 Built in 1916-1920 with funds donated by the Rockefeller family (who owned property in Bar Harbor), the Carriage Road was originally paved for horse-drawn carriages. Now bikers, hikers, horse-back riders, and carriage drivers alike frequent the wide path. This is just an example of the many lakes you encounter on the trail. Truly majestic scenery, if you ask me. 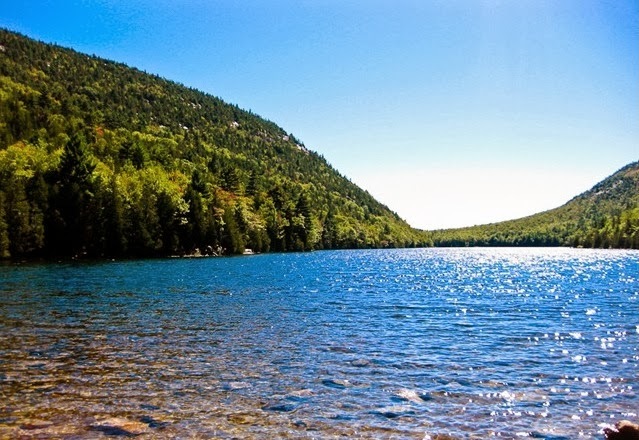 Most of the lakes do not allow swimming, but you sure are tempted to take a dip! 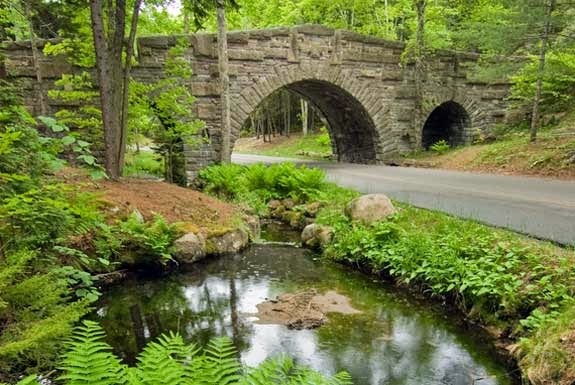 The last place you must visit in Bar Harbor is Agamont Park. It can be a "touristy" area if a cruise ship is docked, but the view is spectacular and it's a great greenspace to sit down, relax, and let the kids run around. We missed the Fall colors on our trip to Maine, but I'm certain it must be an even more spectacular place to visit during Autumn. If you ever need a place to get away and want to experience a place like no other in the USA, think about venturing out to Maine. It's well worth a visit!